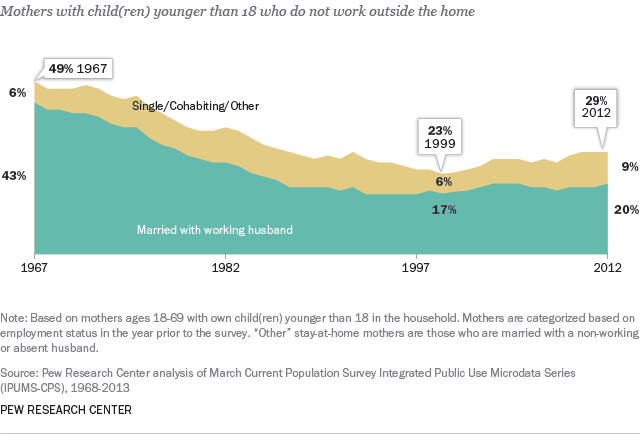 1More moms are staying home: The share of mothers who do not work outside the home has risen over the past decade, reversing a long-term decline in stay-at-home mothers. (In the U.S. today, 71% of all mothers work outside the home.) Two-thirds are “traditional” married stay-at-home mothers with working husbands, but a growing share is unmarried. 2Americans say a parent at home is best: Despite the fact that most mothers in the U.S. work at least part time, 60% of Americans say children are better off when a parent stays home to focus on the family, while 35% say they are just as well off when both parents work outside the home. 3But opinions vary by religion, ethnicity and education: Hispanics, white evangelical Protestants and those who never attended college are more likely to say children are better off with a parent at home. College-educated women are among the most likely to say children are just as well off if their parents work outside the home. 4Stay-at-home moms are poorer, less educated than working moms: Stay-at-home mothers are younger, poorer and less educated than their working counterparts. 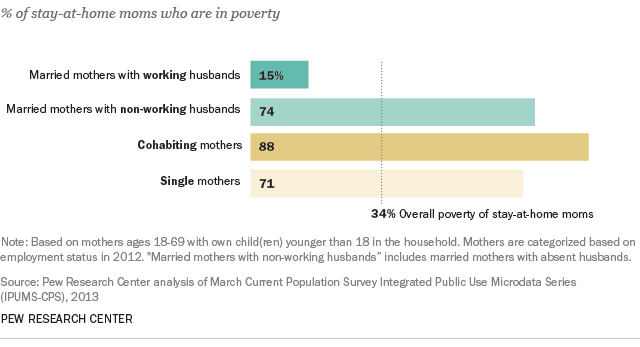 For example, 34% of stay-at-home mothers are poor, compared with 12% of working mothers. They are also less likely to be white and more likely to be immigrants. 5The share of stay-at-home moms in poverty has doubled since 1970: While more stay-at-home moms are in poverty — 34% in 2012, compared with 14% in 1970 — those with working husbands generally are better off than those without. But stay-at-home moms with working husbands are not as well off financially as married mothers who work outside the home. 6Home by choice or necessity? Married stay-at-home mothers with working husbands are more likely than single or cohabiting mothers to say caring for family is their primary reason for being home. Single and cohabiting stay-at-home mothers are more likely than married stay-at-home mothers with working husbands to say they are ill or disabled, unable to find a job, or enrolled in school. Overall, a growing share of stay-at-home mothers say they are home because they cannot find a job: 6% in 2012, versus 1% in 2000. 7How stay-at-home and working moms spend their time: Mothers who are not working for pay spend more time, on average, on child care and housework than do working mothers, but they also have more time for leisure and sleep.